so afterwards we 'invited' them for a beer ha. we had a lot of fun, and both mariola and perry said several times throughout the night that they wish they could meet my parents! and i wish that everyone important in my life could meet them too, definitely two of my favorite people in the world. ive learned more from my intercambio with perry than i did in any of my classes here. this morning we got up and our senora told us our host sister bought liz and i churros for breakfast because its our last sunday en casa. and then our senora started crying because she doesnt want us to leave. bleehhhhh this is the weirdest feeling in the world. 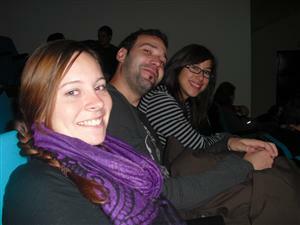 one of my program directors, inma, did a lot of video taping while we were in granada, then made one big video of it. take a look. 2-you have to wear 'the patch' for 5 weeks so you dont go through withdrawls from second-hand smoke. my lasssst trip within europe (FOR NOW) was to paris. i went with my friends liz, catherine, sarah, sera, and kara, and we met liz's friend katrin there, who is studying in Gronoble, just outside of Paris. we spent the first night of our trip in the airport, how fun. NOT. after that we swore we wouldnt ever do it again. we got into paris at about 930 and didnt actually get in and out of our hostel until about 430, almost a whole day wasted waiting for people to do their hair ha, ah well. 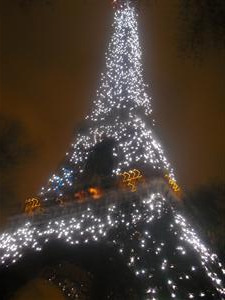 then we met up with my friend sam, who is studying in paris for the year, and went to the eiffel tower. its the 120th year anniversary so they had light shows all night so we watched one of them. so beautiful. i cant wait to show everyone pictures. the next day we took a walking tour of versaille. that was pretty fun, a little rainy. we learned a ton about the 93874289 king louis'. that was actually very intereseting and we had a really great tour guide sooo the next day, we did a walking tour of paris with him. but before that, we discovered a friend in our hostel room...a mouse, yep, and i asked the hostel guy for a mouse trap and he said. oh..you dont want to kill the hostel pet. funny, not. so we slept with a mouse for the rest of our time in paris. the last day in paris was liz's 21st birthday. her and i went to the louve, saw the mona lisa, which funnily is about 2 feet tall, and on the wall across from the biggest painting in all of the louvre, there are 35,000 pieces of art in that museum. it would take three weeks of being in the louvre from open to close, looking at each piece of artwork for 10 seconds, to see every piece of art in the museum. SO GIANT! but it was beautiful, i loved it. funny story. liz and i went expecting to pay the 11 euro to get in, and we walk in and are extremely confused when we cant find the place to buy tickets so we just walk in...and for about 20 minutes we were just kind of laughing and wondering how we just walked into the louvre..without paying..and no one stopping us. turns out they're on strike, which we knew, but the museums had been closed, but for some reason they opened it up and just decided not to charge people for the day, que suerte. how lucky. then lastly we went to..uhh.. montmontra? its a little area just on the edge of paris. its completely different than paris, small and windy roads and a big hill with a beautiful view of all of paris. we sat and ate a crepe with nutella at the top of the hill at a really cute little cafe then made our way back down, in the midst of a gazillion christmas lights. so beautiful. and well whatdya know, our flight was too early in the morning, earlier than any transportation was available, so we spent another night in the airport, the worst night ever. not fun. ha. then liz and i spent the day in madrid on tuesday. we wanted to go to the reina sofia museum to see dali's stuff, but oh what luck, the museum was CLOSED! so we just walked around then headed back to granada. one week til home. yikes! THE best weekend of my life..
yes, the best weekend of my life took place in granada. all the traveling ive done has been wonderful, but this was one of the very few weekends i was in granada and im thankful that i was. the weekend started off on thursday, thanksgiving, although we did have class, weird.. we had an intercambio with perry, and we all know how much i love perry! so that was a good start. 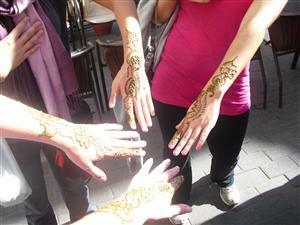 on friday a group of my close girlfriends here went to the arabic baths. they had 7 baths, basically 6 hot tops, but pool size-ish, and one cold pool. they also had a tea room. so we hung out and relaxed for a while, then got a massage. that was so much fun and a great change of pace. its nice to be in a relaxing setting where we can just sit and hang out together. that night we went to my friend sarah's apartment. her home stay is set up a little differently. her and her roommate have their own apartment, and their senora lives in the apartment next door. so cool. so for dinner we made grilled cheese sandwhiches, YUM! and we watched baby mama (THANK YOU MOM AND DAD!!!) while eating popcorn and m&ms. it felt like home. four people came out, two on drums, one on guitar, and one singer. behind them was this giant wall about the size of a movie screen. right as they began to play, a big..blind? shade? type thing started coming up revealing the 'wall' behind them. turns out to be a window. once i realized it, i was like wow..this is going to be a great view of granada. no. i was wrong...BAM right there was the alhambra all lit up. SO beautiful. never in my life have i seen something so beautiful. and never in my life have i cried over something that i thought was beautiful. it was one of the many moments ive had here that i just have to think about the life im living right now. do you understand why we love perry so much??? sunday we were going to alquilar motos, but it was raining so i bummed around and did some tarea instead. pardon the spanglish. but sunday night was the big futbol match! we basically spent our whole weekend with perry. him and mariola invited us to go to a bar with them and mariolas padre to watch the game. so we went to this little completely spanish bar to watch it with them. so typical spain. so much fun. afterward they invited us to their piso. mariola told us that 'when' we come back, we only have to pay for our plan ticket and that we can stay with them. they are so sweet. its making me wonder how on earth i let time go by so fast here, and also how i need to make up for lost time. while at their piso they showed us tons of pictures of the festivals that take place in the spring in granada, including semana santa. every time we bring it up perry says to me 'you! dont cry!' because he knows how sad i am about missing it. GREAT night. so there it is. the best weekend of my life. filled with great people, food, and fun. of course, it was nothing like i was able to describe, but i did the best i could. i will most definitely be coming back to granada some day. the world is like a...kleenex?? first of all, i did not go to fezna morocco? i went to fez, but aparently that doesnt exist in the blogabond world. so some more cultural things im learning from my sweet intercambios. they dont really celebrate christmas here. they do, but its not as big as our christmas, which i thought it was bigger. all they do is have dinner with the family on christmas eve. the 5th of january (wow, january 5th is really what i meant to say, just thinking in spanish...ha) is three kings day. and thats their equivelant to christmas. 20 years ago, papa noel, aka santa clause, didnt exist in spain. he does now thanks to coca cola! but on three kings day, the kids go to this one spot in the city to 'see' the three kings, and while they are there someone puts their presents under their bed. and when they come back, the three kings left them their gifts. very interesting..
today we taught perry the phrase 'holy cow' and he taught us the phrase 'el mundo es como un pañuelo' the world is like a kleenex. this is their equivelant to 'small world' like when you see someone you know in a random place, or someone you know knows someone else you know and you didnt know it. haha im sure you all understand. perry gave erica and i a gift last time we met. its a small button that says 'habla bien, habla andaluz' which means, speak well, speak andaluz...which is the province? granada is in, andalucia. aka, the lisp, and the dropping of the s and the d in words. basically hes saying that we are picking up not only the spanish accent (which is not like the mexican accent we are taught in the states) but the andalucian accent too. im starting to realize very quickly how much im going to miss my friends here. not only will i miss the people in my program who ive gotten really close to, but even more so the spanish friends ive made. chances are slim, but better, that ill see my american friends again, but realistically i probably wont ever see perry again after these next three weeks. its a very weird feeling to have, seeing as i see him three or more times a week while im here, which is really more than i see most friends at home. weird..
anyway, big weekend ahead. turkey dinner tonight! happy thanksgiving by the way! and some people are putting together an american football game tomorrow, woohoo! and arabic baths, renting motos. and most importantly...the barcelona v madrid soccer game. perry invited erica and i to go with him and his finace to a bar to watch the game. someone compared this game to the superbowl, and someone else said every time barcelona and madrid play eachother, its called 'el partido del siglo' the game of the century. im rootin for barca! i hope everyone has a wonderful thanksgiving, ive realized more this year than ever how thankful i am for everything/everyone/every situation that ive ever been in. love you and miss you!! hasta pronto! see you soon! This was the most touristy day/city we were in. 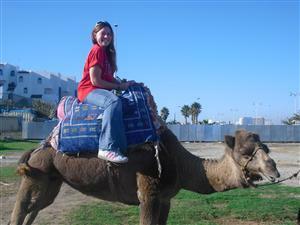 bright and early we got to ride camels! So so so so fun and so so so cool, but it was on the side of the road for less than 30 seconds and it walked in a circle. Ha. 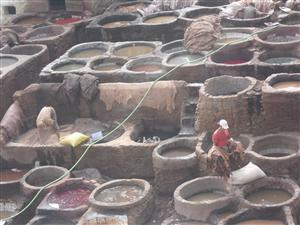 and we went to a leather tannery this day..and this is a picture of them dying the leather..very interesting and very stinky. they gave us mint leaves to put under our noses so we wouldnt get sick..
we would also walk through the markets and see full cows skinned and gutted hanging from the outside of the shop that was selling the meat, I heard several chickens getting their heads chopped off and feathers plucked. Our tour guide(AMAZING tour guide) brought us to a store that sold traditional Moroccan dresses. All very beautiful, the women there wore the most colorful clothes I have ever seen. I loved it! for dinner we went to a traditional moraccan dinner. People who bought the dresses wore the dresses. During dinner there was a band playing some awesome drums and there were belly dancers. So cool and so much fun! This day was another intense day of culture shock. 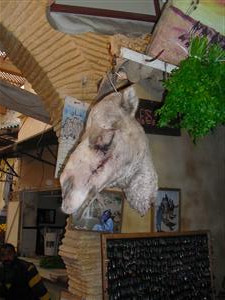 Instead of cows hanging in the markets, there were camels..full on camel heads. Our tour guide brought us to several shops where we could buy rugs, steel, and spices. Very cool, very cheap for what it was, but still really expensive. We were told that people trade women for Houses and camels…so bizarre.. that was also very eye opening…the way women are treated there. Just so different, they basically have no rights to anything. Even just observing while on the bus, all the cafes had ONLY men sitting outside, there were very few women seen on the streets.